The apartment is located on the ground floor in a quiet area of the Marasusa Complex. The apartment has a separate double bedroom which can be changed into single beds as required. In the main room there are another two single beds with a kitchen area at one end of the room, the kitchen has a large fridge with small freezer, cooker hob and oven and small indoor eating area. A travel cot can be provided if required. Outside the apartment is a covered patio area with table and chairs for your personal use and also a small garden area to sit and enjoy watching the world go by. Marasusa has a lovely pool area which is about 50m from the apartment, the pool has a lifeguard 6 days a week in summer. The grounds at Marasusa are beautiful so taking a promenade around the grounds stopping to take the view in at every angle is a lovely walk. If you like Jazz then come and stay in September and enjoy the free Tropea Jazz festival. The apartments are on the ground floor each having a private outside covered patio area with surrounding gardens. The Marasusa complex has a lovely swimming pool with Jacuzzi and children's pool area with a lifeguard. While you visit Tropea you can enjoy a stroll around the historical streets or just relax on the beautiful white sandy beaches. Direct flights from Monarch airline - Every Saturday from Gatwick to Lamezia Terme. RyanAir fly direct to Lamezia Terme from Stansted, Brussels, Dusseldorf, Stockhalm and many others. Alitalian also fly indrect to Lamezia airport. Leave the A3 at Pizzo turning. Follow SP6 (SS522) to Tropea. Parghelia is 3km before you reach Tropea. Take the 3rd turning into the village and Marasusa is sign posted. There is a golf course not to far away called Feudo Montalto Golf Club in Limbadi, which is about 25 km away or 30 min by car. We currently live in Wiltshire England and try and get over to the apartment at least twice a year. We bought the apartment so we could use ourselves and also rent it out when we are not. Most of our family have been out and love the place as much as we do. .
Why did we buy? The views are fantastic, the beaches are clean and we love the local fish. The fishermen go out early morning and bring the fish back to sell to the restaurants for the evening. From the apartment if you get up early enough you can see these fishing boats catching there fish. We love it. The view is unique no other complex in the area will offer you views like these. This is included in the cleaning costs. If you are staying more than a week and require extra linen then there is an extra charge from our cleaning company. There is a washing machine and dryer on the complex to use and the cost is about €3.50 per wash. The is a car park for guests only. This is included in the cleaning costs. If you are staying more than a week and require extra towels then there is an extra charge from our cleaning company. The living area is really outside as the apartment has a bed room and kitchen area, But in the summers months you would only want to sit outside under the porch covered area. A good size fridge with a separate freezer on the top. The freezer is large enough to fit plenty of food in. A nice size everything you need for your stay. There is a small table for 4 people inside but I am sure you will eat outside and the lovely large round table. Breakfast is fantastic outside with the views. The complex has excellent gardens which are well kept. In the complex has many viewing balconies all these you can view the scenery. On the beach at Sharks Bay you can hire many different sea items - jet ski, canoes etc. All available in the harbour to hire. This pool is shared with the other guests but never busy. There is a life guard full time in the day and also a safe childrens area. . The pool is excellent and is about 60m away for the apartment. The apartment is perched on the hill side which allows you to view the whole surrounding area of Tropea while you dine on the patio, you feel so relaxed just watching the boats come into the harbour or just watching the cars drive down the roads towards the beach. In Tropea There are many restaurants you will never run out of choice, most of them you can eat ever inside or out the choice is yours. All the beaches have beautiful clear blue water with small waves. Access to the apartment is through a locked gate and is not open to the general public - the complex has it's own security guard and is kept safe at all times. Top location for relaxing holiday ! Good for an return for another visit ! A fabulous apartment with a stunning view. 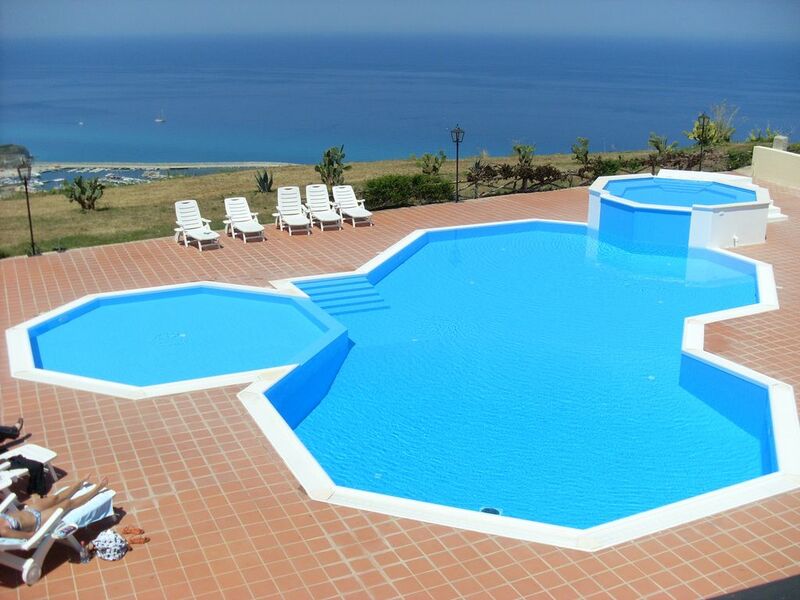 Great location in a beautiful complex nestling on top of the hill.Fabulous views of Tropea and Stromboli! !i would recommend the apartment it's very well equipped and couldn't be better situated.Jill,the owner,provided excellent advice and was extremely accommodating with our holiday wishes. Thank you do much for you feedback. I try and answer all our guests questions honestly as I want you to enjoy your holiday. Thank you again. Waking up to the view - priceless! The flat is set in a stunning complex a top of the hills of Parghelia, it's very well maintained, quiet and has everything you need, it's also in a very convenient location to visit Tropea, Capo Vaticano, Stromboli and even Sicily. Booking the apartment couldn't have been easier, Jill is extremely helpful and provided a handy arrival/ things to do information letter. The apartment was spacious, clean and the view from the terrace took my breath away each day - I wouldn't hesitate to come back and stay at Marasusa. I am so pleased that you enjoyed your stay. Thank you. Calabria is situated at the toe of Italy’s foot, very popular with Italian and German tourists. The area offers many picturesque villages with excellent beaches to enjoy around the Tyrrhenian Sea. • Visit Isole Eolie or Volcanic island of Stromboli by boat from Tropea marina. • Scuba Diving and fishing trips available in Tropea. • Golf course 30 min drive. The nearest town is Tropea which easily wins the contest for prettiest town on the Calabria Tyrrhenian coast, with its narrow streets and beautiful historic buildings, or just stroll down to one of the many beaches that surround Tropea and enjoy the beautiful turquoise clear seas. You could hire a pedalo or learn to scuba divie at one of the local schools..
Parghelia has its own beautiful white sandy beaches or you could just chill out in the local coffee/ice cream shops and sample their lovely cakes/ ice creams. In Parghelia you can enjoy a meal in the local restaurants and bar too. There is a coastal train that stops at Parghelia on its journey around the coast line a great way to see Calabria at a low price.